Obermeyer Gloves are patterned for motion. 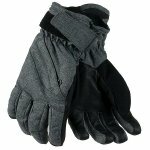 Extra length in the patterns and are slightly pre-curved fingers – crafted to mimic the shape of a gloved hand and grip. Integrated heater pouch pockets allow you to add chemically enhanced heat packets to the glove. This is especially beneficial to one's extremities which typically have lower blood flow. A must on cold days.